Consensus building is often cited as one of the core features of German political culture, but do the results of the 2017 federal elections suggest a different approach is required by the country’s mainstream parties? Ross Campbell highlights that with the growth of the AfD, the political system must now adapt to a new political actor from the right, with an adversarial style and a foothold in an increasingly crowded electoral landscape. As the dust settles from the federal elections in Germany, two major stories are attracting significant academic commentary. The first is the decline of Chancellor Angela Merkel. Despite winning a fourth term in office, support for the CDU/CSU fell to its lowest level (33%) in federal elections since 1949. As searching questions were being asked about a dearth of policy proposals and a lifeless campaign, the normally dependable Chancellor faltered by claiming that the CDU had ‘achieved its strategic goals’ – sentiments that hardly resonated with the party’s losing candidates or wider membership. An out-of-touch Chancellor unlikely to secure victory at the next election will leave many in the party believing a change of leadership and new policy directions are immediate priorities. The upshot of this is that Merkel may not leave office at a time of her own choosing – an eventuality unthinkable at the start of the campaign. Compounding Merkel’s difficulties, she now enters coalition negotiations from a weaker position. The Social Democrats (SPD) have ruled out another grand coalition, leaving the only option a so-called ‘Jamaica coalition’. This would bring together the CDU/CSU, the business-friendly Free Democrats (FDP) and the Greens. These parties have governed together at the state level, but a programme for government at the federal level is a more complicated entity, since it requires long-term commitments on areas where agreement will be more difficult to forge. Whilst the FDP are more likely to join the government, the Greens may be harder to entice, a point which increases their leverage in the negotiations. Significant concessions will need to be forthcoming if the coalition talks are to be successful. Even so, however, the agreement would require the approval of the Green Party membership and it is by no means clear that this will be granted. The second crucial development in the election was the breakthrough of the Alternative for Germany (Alternative für Deutschland). Founded in February 2013 by Bernd Lucke and a group of economists, the party advocated the abolition of the euro and the monetary institutions of the EU. It was, in effect, a single-issue protest party. As the worst implications of the sovereign debt crisis became apparent, the message resonated with voters and the party secured 4.7 percent in the 2013 federal elections. Despite its success, this meant that it narrowly missed the five percent threshold required to obtain a proportional share of the seats in Germany’s parliament. Analysis of the AfD’s voters, meanwhile, revealed an intriguing set of factors driving people to vote for it. The party was supported by young eastern males who were opposed to the euro. It also mobilised the politically disaffected – especially those dissatisfied with the incumbent government and those opposed to Chancellor Merkel continuing in office. Those without party-affiliations and fervent opponents of multi-culturalism and immigration also turned out and voted for it, as did those who were economically pessimistic. These are standard factors often found in studies of the radical right. But there are ways in which the AfD differs. The party, for example, attracted trade unionists and those in favour of greater redistribution of wealth, suggesting a more diverse voter profile than that commonly associated with the far-right. Together, these factors signalled that it would be a viable competitor in future elections. In this regard, an impressive series of results in state elections augured well for the party. 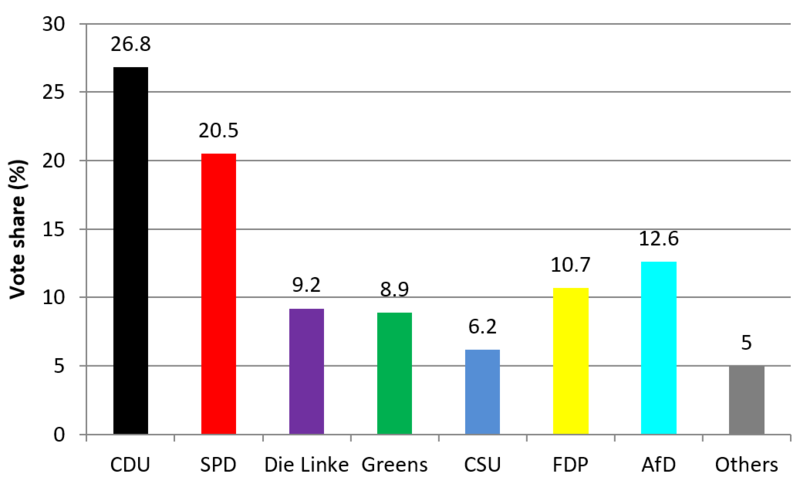 The AfD secured 9.7 percent in Saxony in August 2014 and 12 percent in Brandenburg in the same year. Sectarian infighting, however, was rife, and Lucke was eventually jettisoned and replaced by Dresden-born Frauke Petry, who took the party in a more nationalist direction. Petry attracted attention for advocating that the border force should ‘shoot at migrants’ attempting to enter the country. But under Petry’s leadership, less impressive results followed in state elections in Bremen and Hamburg in 2015. Nevertheless, they confirmed that the party’s support was neither a temporary phenomenon nor geographically confined. Across a number of states, it had the potential to cut into the votes of the CDU, SPD and the far-left Die Linke. In 2016, it secured 15 percent in Baden-Württemberg in March and a staggering 21 percent in Mecklenburg-Western Pomerania in September. Yet this year’s federal election results were the most impressive achievement in the party’s history. By securing 12.6 percent of the popular vote, it enters Germany’s parliament with 94 deputies, the third largest electoral group. 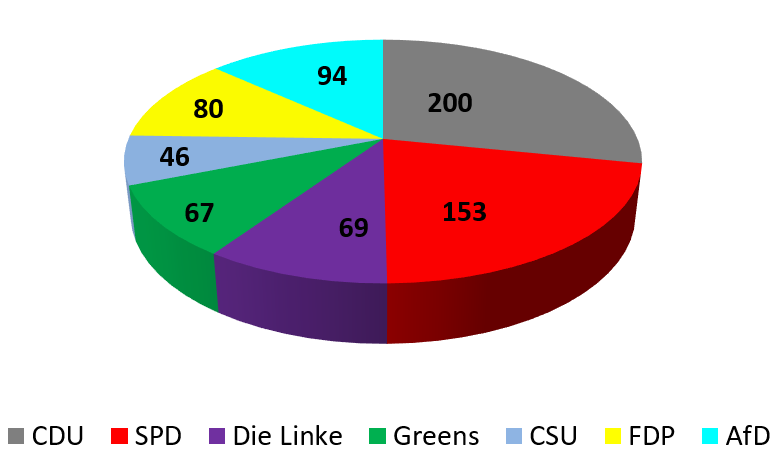 Preliminary analyses suggest that the party took over a million votes from the CDU and over 500,000 from the SPD. This achievement, however, came amidst a disjointed campaign, with open disagreements about its core message and tactics. Björn Höcke, for example, attracted widespread opprobrium for denouncing the Holocaust memorial site in central Berlin as a ‘monument of shame’. Alexander Gauland, meanwhile, has spoken of fighting an ‘invasion of foreigners’. And party representatives repeatedly claimed that the AfD stands up for hapless victims of globalisation, despite the campaign being fronted by Alice Weidel, a former employee of Goldman Sachs, who, fluent in Mandarin and resident in Switzerland, could reasonably be mistaken for a member of the global elite. Opposition to the euro (but not always to the EU), meanwhile, was merged with lifestyle and identity-based issues, including a hardened sense of existential angst about the future of Germany. And on an automated message board near Alexanderplatz in East Berlin, two campaign posters declared: “Courage for Germany” (Mut für Deutschland), followed by “Stop Islamification” (Islamisierung stoppen). Strident Islamophobia was thus twinned with a nationalist discourse. The diversity of its linkage points may have helped attract voters. Yet they betray friction within the party, as evidenced at the post-election press conference, when Frauke Petry abruptly announced that she was leaving the party and would sit in parliament as an independent. The AfD may well regroup, enabling it to speak clearly on migration, the refugee crisis and sovereign debt. But this is far from certain. What is clear, however, is that a system famed for its consensus building approach and government from the centre must now adapt to a new political actor from the right, with an adversarial style and a foothold in an increasingly crowded electoral landscape. Note: This article gives the views of the author, not the position of EUROPP – European Politics and Policy or the London School of Economics. The author took part in an election trip organised by the International Association for the Study of German Politics and would like to highlight the generous funding provided for this by the German Academic Exchange Service (DAAD). Ross Campbell is a Senior Lecturer in Political Science in the School of Media, Culture and Society at the University of the West of Scotland.